Faculty at Chicago Lake Shore Medical Associates support The Global Health Initiative Fund, which provides resources for global health research initiatives and education programs benefitting medical students, residents, fellows and faculty members of Northwestern University Feinberg School of Medicine. Read a blog by Joe Brown, a GHI-funded FSM student who spent a year in Kacllaraccay, Peru, where he helped build a clinic. Read the blog of Amy Chen, a GHI-funded FSM student who did a rural rotation in Montana. Also featuring Amy Chen's trip is the article "Rotation in Montana Offers Insight into Rural Healthcare", which is featured on the on the FSM website and written by Sarah Plumridge. 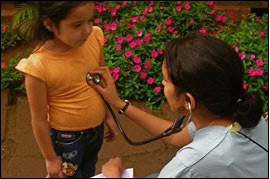 In Belize, there is only 1 doctor for every 18,000 people.